For its description, the Cap Estel in Eze calls the most lyrical words and the comparison with a patch of paradise comes at once to mind. Nestling in a lush, exceptional green setting, feet lapped by the Mediterranean and head caressed by pines, the Cap Estel was born in 1900 thanks to a visionary, Frank Harris, author and journalist friend of Oscar Wilde. Over the decades, this luxurious vacation home for wealthy clients became a legendary place by hosting the most famous people in this world. Specifically dedicated to pampering, the Cap Estel, recently half-opened its mythic gate on its stunning five-acre park, peppered with ponds, fountains and terraced gardens with Mediterranean species, to let the public discover its restaurant La Table de Patrick Raingeard and its well-being area near the Spa and pool. In 2012, La Table de Patrick Raingeard had already been awarded three “Toques” by Gault and Millaut and by awarding Patrick Raingeard the only “macaron” of his vintage 2013 in the Alpes-Maritimes, the Guide Michelin offered its readers not only to live an unforgettable culinary experience, but also a true taste of eternity parenthesis in a mythical setting. Patrick Raingeard served his culinar apprenticeship and perfected his skills with some of the greatest contemporary chefs – Alain Passard (***Michelin), Jacques Maximin at Ledoyen (**) The Elysée Lenôtre (**), La Mère Poulard at Mont Saint-Michel and Ladurée Paris with Pierre Hermé and Patrice Hardy. This passionate Breton conquered his first Michelin star in the Principality of Monaco, sticking to his credo: “Transcending the simplicity is a form of elegance.” Intuitive, generous, rigorous, he practices an instinctive, contemporary cuisine, loving to put himself at risk at each new seasonal carte, served by a rigorous, flawless execution. 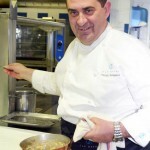 A passionate, whose cuisine combines modernism and generosity. 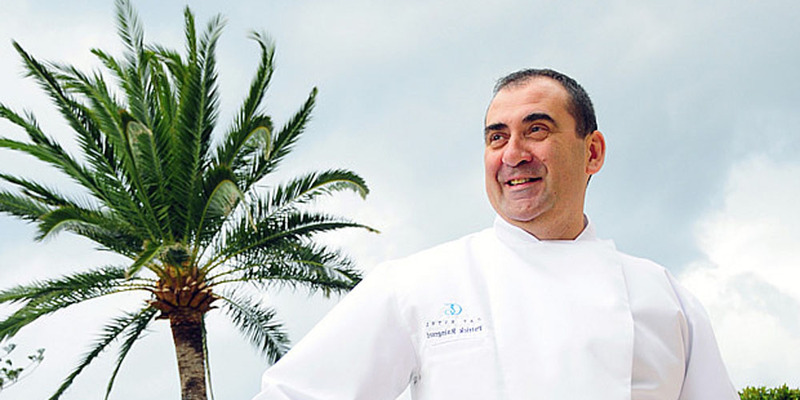 A lover of Mediterranean products and heritage vegetables that he already has planned to grow in the garden at the heart of the magnificent park, Patrick Raingeard offers affordable gastronomy, in line with the positioning of the Cap Estel. 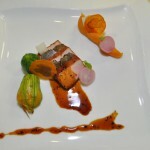 The menu “en toute simplicité” is presented at 39 €. The opportunity to discover, the famous Foie Gras lPllipop with Port stripes and cinnamon spéculos, the Cupidon of Pigeon with candied kumquats or its Coquilles Saint Jacques (scallops) à la plancha, tangy mango juice, Panets light foam with verbena. 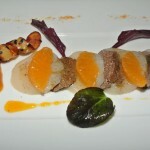 The local terroir is also honored with the lamb from Puget-Théniers, the lemon from Menton and tangerines from La Turbie. The Michelin star will give a new boost to the creativity of this “piano” virtuoso, to discover from Monday March 4, when La Table de Patrick Raingeard et L’Hôtel du Cap Estel reopen. A tasty experience to continue in a spa cascading down to the Mediterranean or around the Sunday brunch with champagne served in the magnificent park overlooking the sea.